Planets orbit close to a cool, small red dwarf star — the most common type of star in the galaxy. Exoplanets are showing up in some unexpected places. From the small, rocky world orbiting Proxima Centauri, our nearest galactic neighbor, to the stunning assortment of potentially habitable planets in the nearby TRAPPIST-1 system, the more we stare at the red dwarf stars in our galaxy the more we find potential homes for life. Thus the inevitable question: Is there any life out there, lying out on some alien beach, struggling to get a decent tan under the glare of a dim, red sun? Farther from the core, the intensity of radiation drops off, but the plasma of the sun remains thick and soupy, preventing easy progress. Thus, the outermost layer of the sun is convective. It's blazing hot on the inside layer but near absolute zero on the outer surface exposed to space. Just like a pot of water on a hot stove, blobs of gas at the bottom heat, expand, become buoyant, rise to the surface, cool and sink back down. The resulting granules are about the size of the Earth, which is a pretty awesome thing to think about. But in a red dwarf star the radiation never gets to be in charge. The intense core is connected directly to the convective layer, carrying heat from the inferno and dumping it into empty space. This connection is very unstable; any slight variation in the nuclear reactions gets amplified by the chaotic mixing and convecting of the star's volume. That makes the star far more variable and the surface way more splotchy, with "starspots" — the equivalent of sunspots on these alien surfaces — sometimes covering half the face of the star. Red dwarf stars are known for sudden, intense bursts of life-killing radiation, and can vary in brightness by as much as 50 percent when they're in the mood. Hardly the stable, same-as-yesterday conditions that life needs to gain a foothold and thrive. Life as we know it requires liquid water, which can only exist (on the surface of a world!) in a thin band of orbits around a given star. Too close and the water evaporates. Too far and it freezes. Just right, like in the case of Earth and the young Mars, and life has at least the starting place. Because of their low-level output, for a red dwarf this so-called habitable zone is right up in the star's face, closer than Mercury is to our own sun. And when small objects are placed in close orbits to larger objects, tidal locking inevitably sets in: One side of the planet bakes in unending misery while the other is doomed to the icy bleakness of perpetual night. Plus, the too-close-for-comfort nature of the habitable zone means that any stellar flare-ups or brightness changes simply can't be ignored. And yet, life just might find a way to eke out an existence — and even thrive — on these worlds orbiting small red stars. Here's the thing: Red dwarf stars are by far the most numerous kind of star in the universe, making up about 75 percent of the stellar citizenry. In our own suburb of the Milky Way, it's even more: Within the few thousand light-years of stars visible to the naked eye from Earth, there are billions more that are too small and too dim to be seen without optical aid. Red dwarfs have another trick up their home-for-life sleeves: their longevity. With their relatively mediocre fusion rates and constant internal mixing, they're the economy cars of the universe, capable of efficiently sipping at their hydrogen fuel reserves for trillions of years. Stars like our own sun, by contrast, are practically gas-guzzlers, and the 10-billion-year lifetime we assign to our star pales in comparison. So even if life doesn't get a chance on any red dwarf stars now, just wait. And keep waiting. As long as you can keep coming back to the casino you always have a shot at the Big Win. The prison of tidal locking might be mollified by ocean and atmospheric currents capable of transporting heat. The stellar flares might seem bad now, but as small stars age they might calm down. And in the far, far future, larger stars like our sun will become ever more rare as the universe winds down and gas reserves start to run short. 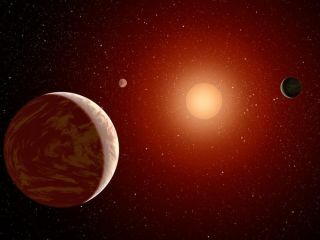 So, it may be — and we're far from knowing for sure at this stage — that life on a planet orbiting relatively far from a relatively large sun-like star is…relatively rare. But even without any worlds serving as a home for life, these small, red stars are the most common stellar citizen in the galaxy and worthy of further study. Learn more by listening to the episode "Why are small stars such a big deal?" on the Ask A Spaceman podcast, available on iTunes and on the Web at http://www.askaspaceman.com. Thanks to Tripp B., @2beaugirl, Steven D., @DesRon94, and Matthew A. for the questions that led to this piece! Ask your own question on Twitter using #AskASpaceman or by following Paul @PaulMattSutter and facebook.com/PaulMattSutter. Follow us @Spacedotcom, Facebook and Google+. Original article on Space.com.